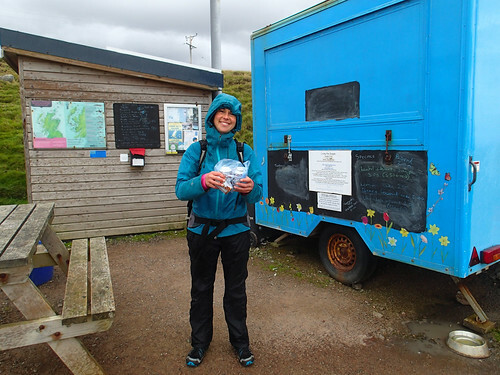 It was a long day for us; we left the carpark at 7:30am before the tea van was open and came back after it had been closed (18:20) and in rain, primarily because we had waited for 4 hours for the tide to recede at the base before the climb. I suspect the show owner/keeper thought we were having a hard time, spending hours on/to the route, and left a small gift for us. How sweet!! Note we left the climbing guidebook on the dashboard of the car, and so it was obvious we were climbers.